KANSAS CITY, Kan. – As well as Martin Truex Jr. has run at Kansas Speedway, it’s nothing short of remarkable that the driver of the No. 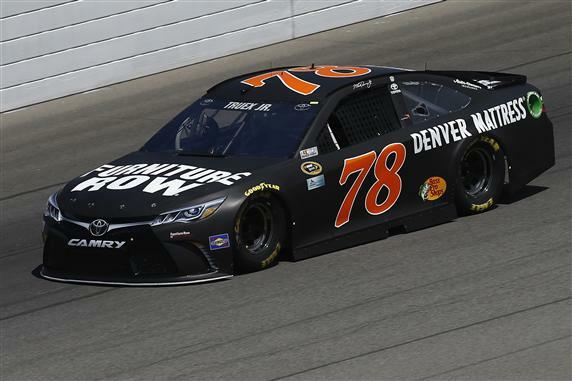 78 Furniture Row Racing Toyota has never won at the 1.5-mile track. Truex has led laps in seven of his 16 starts at Kansas—in some cases, lots of laps. In the spring of 2012, while driving for Michael Waltrip Racing, Truex was out front for 173 circuits before finishing second to Denny Hamlin. Most recently, Truex won the pole and led 172 laps at Kansas in May, only to finish 14th after a late-race pit road snafu. But with a berth in the Round of 8 of the Chase for the NASCAR Sprint Cup on the line in Sunday’s Hollywood Casino 400 (on NBC at 2:15 p.m. ET), Truex couldn’t think of a better time to get a breakthrough victory. “Yeah, I definitely get a positive vibe coming here – a positive feeling that we’ve been so close,” said Truex who won at Chicagoland and Dover in the Chase’s Round of 16. “We’ve done just about everything here but win, and I feel like it’s time for us to make that happen.